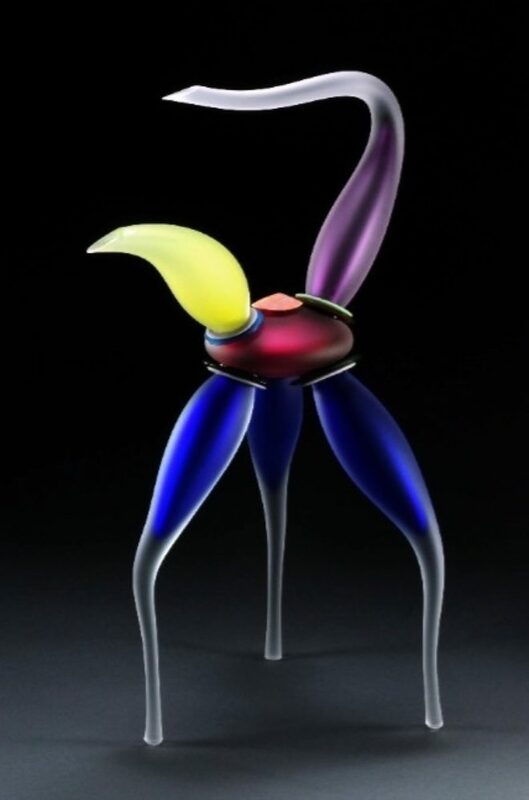 Stephan Cox’s Yellow Spout looks like a crossing between the human body and an exotic, colorful glass bird. The teapot is, at first glance, a simple object: a hollow vessel with spout, handle, and lid created for steeping and pouring. And yet, Morgan Contemporary Glass Gallery in Pittsburgh, Pennsylvania, describes the artists featured in the 2018 “teapots!12" exhibition as having “accepted the teapots! challenge.” So, what is the challenge of the teapot? Perhaps it is not only the challenge of translating an artist’s chosen media into innovative teapot-like forms, but also choosing between the various experiences and images that gather around this structurally simple, but symbolically-laden object. The teapot, after all, seems to simultaneously evoke childhood whimsy, domestic warmth, and sacred space. The more than 50 artists chosen to participate in this year’s twelfth annual teapots! invitational, like those before them, have created teapots that reflect their particular interests and chosen media, as well as their creative responses to the various images and experiences evoked by the teapot. 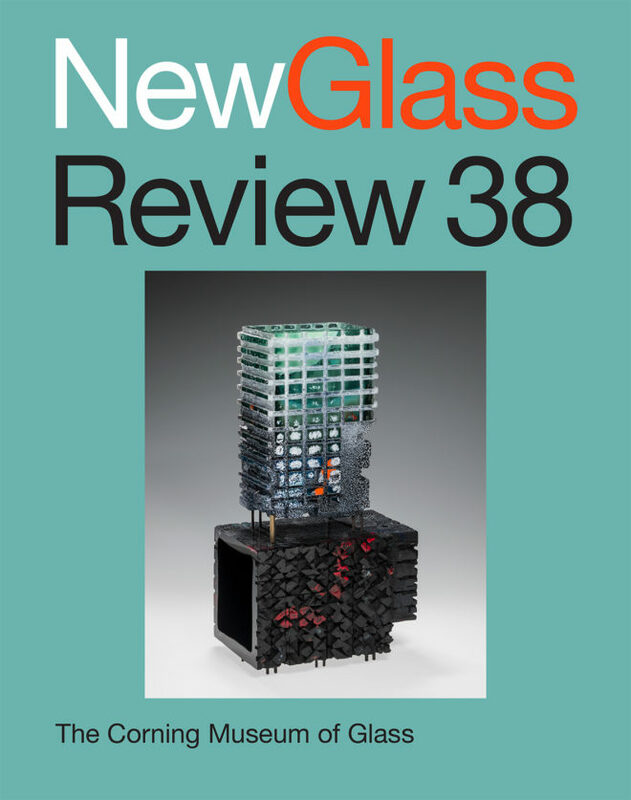 The cover of the most recent issue of New Glass Review. For 40 years, glass artists, collectors, and curators have eagerly awaited the arrival of the annual Corning Museum of Glass publication New Glass Review as a rich and authoritative guide to some of the most important new work in glass from around the world. (Note: A special bonus for Glass magazine subscribers is a complimentary copy of New Glass Review bundled with each summer's issue) Under the leadership of the museum's new curator of modern and contemporary glass Susie Silbert, the next edition of this seminal publication will be significantly expanded, resulting in not only a fully redesigned publication but accompanied by an exhibition of the same name at the museum's Contemporary Art + Design Wing, all in a bid to expand the impact and prominence of the New Glass project. Natsuki Katsukawa, Microworld Specimen, 2016. Blown and fused glass. H 23, W 34, D 34 cm. photo: natsuki katsukawa. courtesy: glassmuseet ebeltoft. For the first time in its 40-year history, the "Young Glass" survey exhibition of new talent has traveled from Denmark’s Glasmuseet Ebeltoft &mdash; which, from its location in the old port of the town of Ebeltoft, has hosted the once-every-10-year event for the past four decades &mdash; to an additional venue. The second location is appropriately enough, another port and the site of a former shipyard in Sunderland, England, that now hosts The National Glass Centre at the University of Sunderland. This edition of "Young Glass" includes the works of 57 of “the finest young, international artists working in glass” (in this case, "young" being defined as being born after January 1, 1982) from 18 countries. The exhibition introduces fresh perspectives and innovative works to an area eager to cultivate and revive its artistic and cultural life. 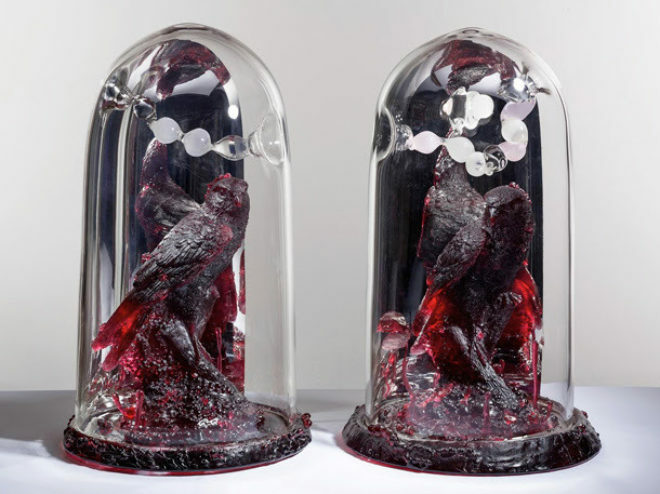 Sibylle Peretti, Where The Rubies Grow I and Where the Rubies Grow II, 2018. Glass. H 23, W 12, D 12 in. Today, the Chrysler Museum in Norfolk, Virginia, unveils the simultaneously somber and captivating works of Sibylle Peretti in "Promise and Perception: The Enchanted Landscapes of Sibylle Peretti," organized by the museum's former curator of glass Diane Wright, who left recently to become curator of glass at the Toledo Museum of Art in Ohio. Wright describes Peretti as composing "poetic narratives about the relationship between humans and the natural world." Peretti herself, in a YouTube video, expands on this idea, describing her work as dealing with human failings and our inability to find harmony and unity with nature. "Promise and Perception" combines new and old works to introduce audience members to Peretti's immersive and poetic narratives while encouraging contemplation on the potential of achieving harmony with the natural world. Artist Sharif Bey began our telephone conversation by describing an image he had seen of a young Berber girl in North Africa wearing a series of amber-beaded necklaces. Though beautiful, the necklaces “didn’t look comfortable,” he said; there was something precarious and heavy about them. Why wear them, then? “She’s wearing this for some reason,” Bey said, conveying the sense that these necklaces and the beads of which they are composed have power and resonance, something that allows them to be more than objects of personal adornment. The large-scale glass and clay necklaces currently on view at the Pittsburgh Glass Center exhibition entitled "Sharif Bey: Dialogues in Clay and Glass" are the products of Bey’s inquiry into this resonance -- something he creates through both size and the combination of particular materials -- as well as his interest in the symbolism of beads and their relationship to collective identity. 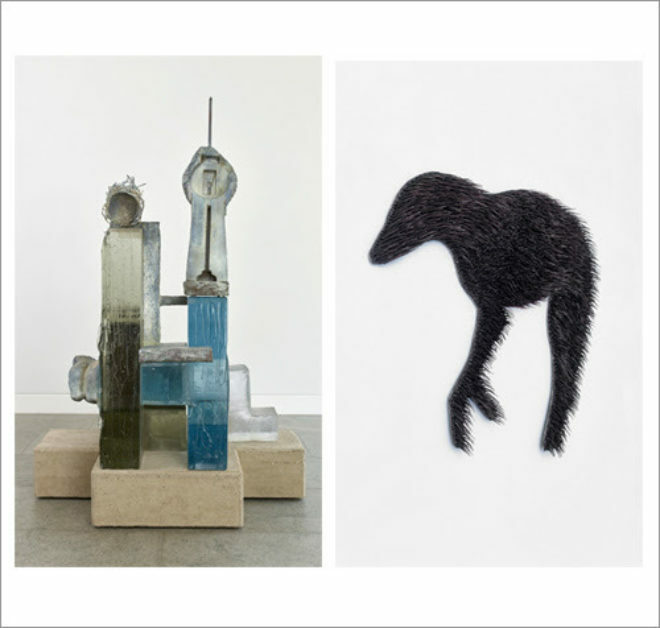 Wilken Skurk's Home (2011) and one of Dafna Kaffeman's wolves as presented on the web page for "If I Had A Home" at lorch + seidel. A new exhibition If I Had a Home, on view at Berlin's lorch + seidel contemporary through April 14th, juxtaposes what initially seem like widely different works by Dafna Kaffeman and Wilken Skurk. Kaffeman’s wolves, formed of spiky, flame-worked glass fixed to aluminum with silicone, adhere to the walls beside Wilken Skurk’s glass and bronze sculptures Home (2009), Nest (2007), and Tressor (2006). In general, both artists create works that are more than what they seem. What appears to be a simple portrait of a wolf or a sculpture that resembles an architectural model of a building actually contains layers of political and personal meaning. In bringing these two artists’ works together, lorch + seidel suggest that there is a conversation going on here, one that is related to the concept of home, and, perhaps, its stability. Upon closer examination of individual works, an even more-poignant contrast emerges between the two artists and their respective views on safety in an insecure environment. Michael Crowder, Une Petite Pipe Morte (A Little Pipe Death), 2009. 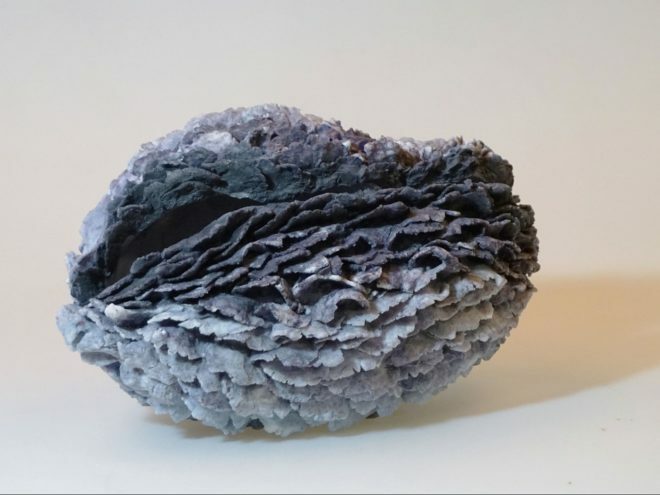 Cigarette ashes, resin. H 3, W 5 1/2, D 1 1/2 in. photo: david a. brown. courtesy: houston center for contemporary craft. The above image is not a pipe. 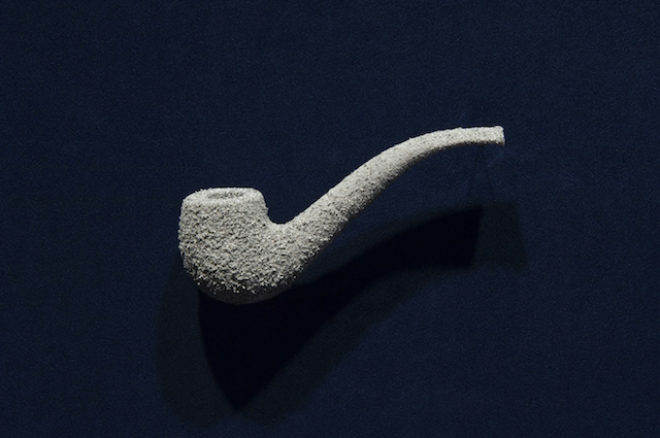 It is a representation of a pipe created from cigarette ashes and resin by artist Michael Crowder, inspired by René Magritte’s iconic painting The Treachery of Images (1928-1929). This pipe is one of several of Crowder’s works currently on display in the exhibition Treachery of Material: The Surrealist Impulse in Craft at the Houston Center for Contemporary Craft (HCCC). 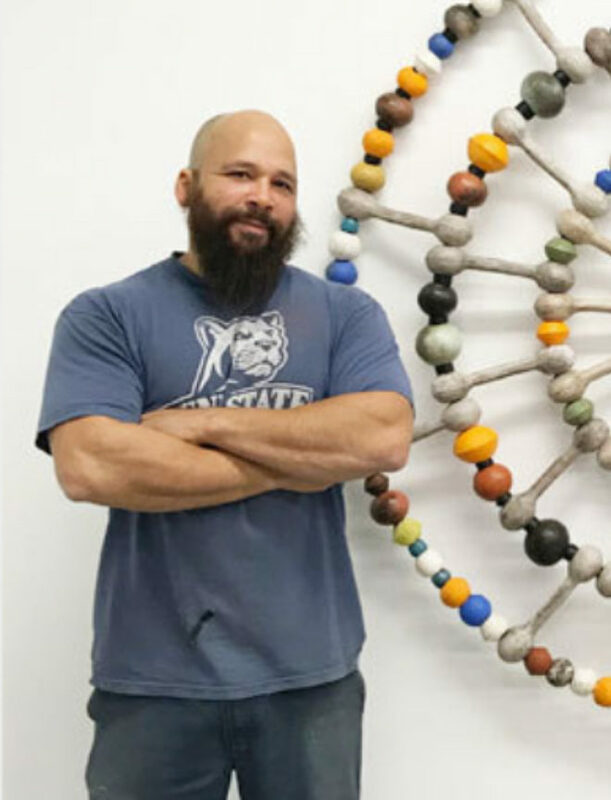 The exhibition presents a series of “puzzling and beautiful” objects made by Houston-based Michael Crowder and Estonia-based artist Julia Maria Künnap. Performance: Julianne Swartz's Sine Body with Estelí Gomez. 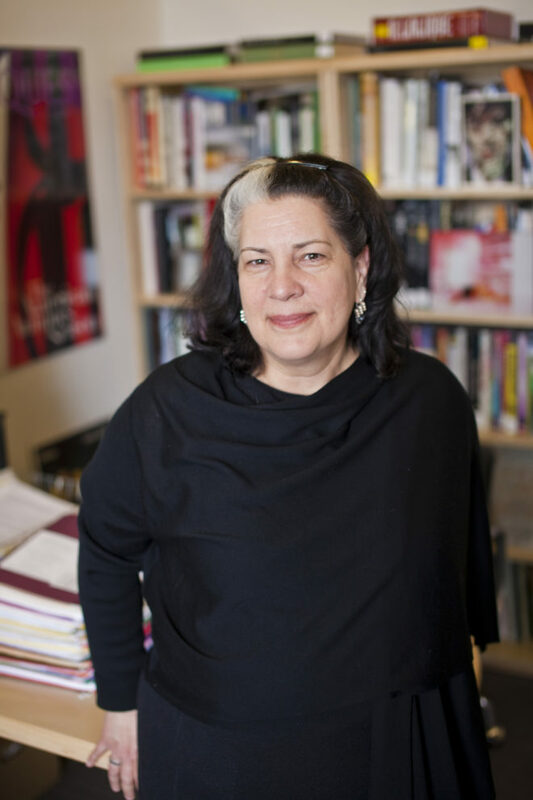 2018. photo: heidi bohnenkamp. courtesy: the artist. Stepping into a curtained section of the fifth-floor gallery of New York City's Museum of Arts and Design (MAD) on Sunday February 11th, I picked up a perceptible hum in the room. It wasn't the hum of the crowd (which, initially, was absent) or the muffled hum of the city outside. Instead, it seemed to emit from the glass and ceramic vessels arranged on three large flat tables in the gallery. The vessels appeared to be frozen in various stages of flow, or, perhaps more accurately, transformation, like bulbous glass snakes shedding their skin or larvae playfully moving in and out of their delicate cocoons. 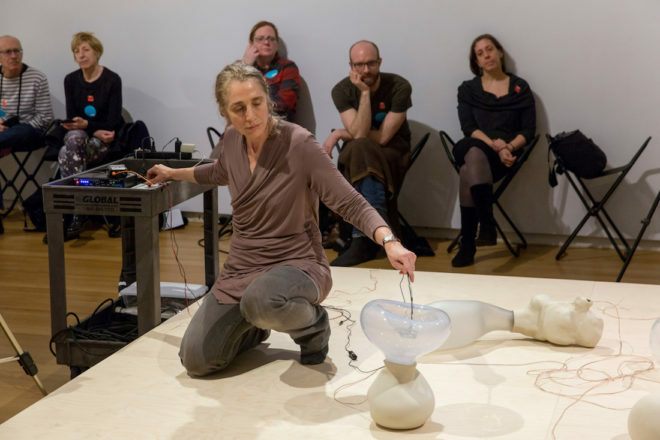 The works were from Julianne Swartz’s Sine Body series of glass and ceramic vessels that each produce a particular sound generated through an electronic feedback mechanism. The live performance was just one part of the Sine Body installation, itself a part of a larger exhibition at MAD titled "Sonic Arcade: Shaping Space with Sound" (on view through February 25 2018), which consists of multiple installations and interactive environments that explore how sound shapes spatial and interpersonal relations.